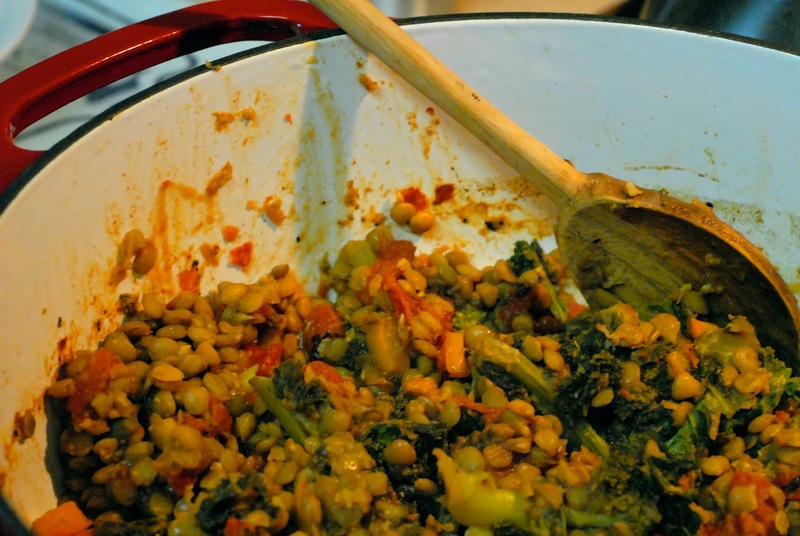 This was one of my first times cooking with lentils and I was shocked at how good this was. You won’t even miss the meat, I promise and it is really easy to make. The lentils gave this chili a great flavor and texture. The way it covers the vegetables is almost like a gravy. It had every taste component; a little salty from the stock, a little sweet from the fire roasted tomatoes and bell pepper, great texture combining the soft lentils and crunchy kale, and a great aroma from the onions and fresh vegetables. And best of all, it’s a one pot meal and relatively easy to prepare! Heat olive oil in a pot or dutch oven. Add diced onions, turn heat to medium low, add a sprinkle of kosher salt and cook for 7 minutes, stirring occasionally. Add lentils and “toast for another minutes stirring often. Add stock, bay leaf and water, turn heat to high and bring to a boil. Reduce to simmer and let lentils simmer for 15 minutes. After 15 minutes, add bell pepper, tomatoes, cumin and chili powder. Cook for another 15 minutes. Stir in Kale and cook for another 10 minutes. You can add the kale earlier with the other veggies if you want it soft, but I kind of like it when it’s a little crunchy. Like most chili’s this tastes better after it sits for a bit!